The Nomos Tangente movement begins with a traditional Glashutte 3/4 plate which is rhodium plated and decorated with Glashutte ribbing and Langeleist perlage. 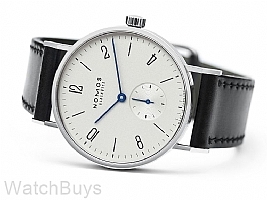 Verified Owner Comments: I've been intrigued by the Nomos brand for awhile and finally took the plunge recently; I have to say, this watch is beautiful in its simplicity. Initially, I was a bit concerned it might be a tad too small for me at 35mm, but it does wear larger on the wrist and I'm glad I went with this size. The manual winding feels excellent and very engaging. I actually look forward to the mornings just to wind it! The face is simple and legible. Coupled with the other details like the signed crown, the blued hands, it is a subtle stunner! I also really like the Shell Cordovan strap as it requires no break in and is comfortable right from the get-go. For my use, I will primarily be wearing it for more formal occasions and work, but it has a versatility to its design that it would go just fine with some jeans for a casual day. Great piece and highly recommended! Verified Owner Comments: These watches are incredible in the execution of details, despite its clean Bauhaus design. When I wind this watch in the morning, I have a pleasant feel of the winding crown engaging in the movement and hear a pleasant clicking sound. The blued hands are striking and attract attention on the white dial. The movement in this watch is their own in-house movement and is "spot-on" accurate as these watches are calibrated carefully before they leave the factory although they do not come with a COSC certificate. I hope in the future NOMOS offers a larger size around 40mm, but the 35mm makes an excellent dress watch to wear with a shirt with cuff links. The case design hugs the wrist and its so comfortable to wear. The strap is THE best strap I've seen on any watch at any price. It's so soft and pliable and buffs up to a nice black sheen with a terry cloth towel. The fit and finish of this timepiece seems like it's a much more expensive timepiece.